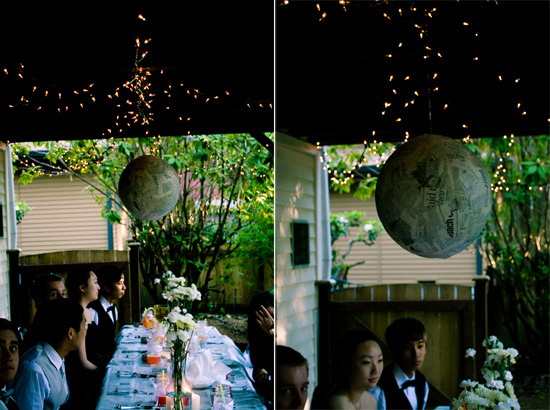 Last weekend my brother asked me put together a table setting for his prom night dinner. 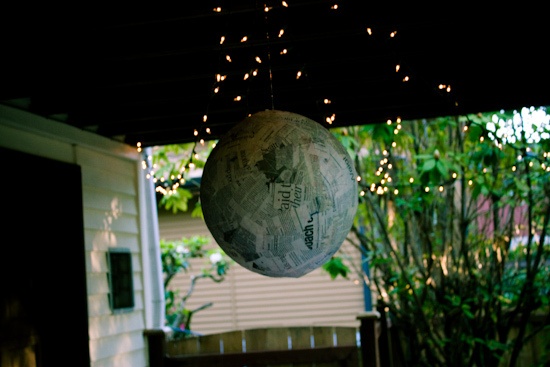 I wanted to do something modern and fun (and of course inexpensive), so decided to get creative with some newspaper. With a little help from family and friends, I quickly threw together this hanging newspaper centerpiece. It helped to give the table setting the fun and modern look I was going for. Unfortunately, between doing a pre-prom photo shoot, and braking my most beloved camera lens, I wasn't able to get many shots of the table setting. It really did turn out fabulous and these pictures don't do it justice! Oh well, I'm just glad I was able to spend some time with my awesome brother...Happy Graduation Isaac! 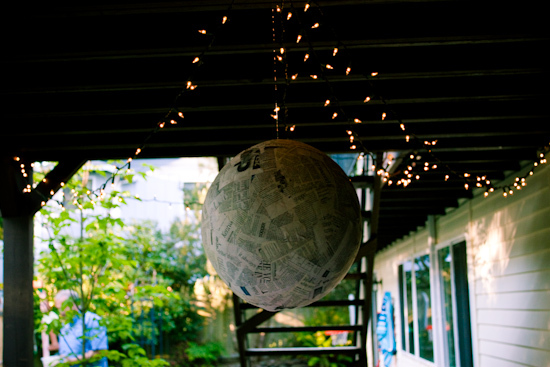 Get the tutorial for this newspaper ball below! Step 1. 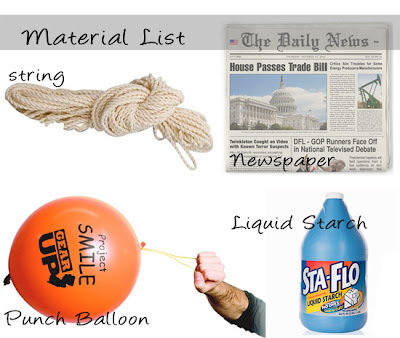 Blow up your punch balloon to desired size and tie off end. 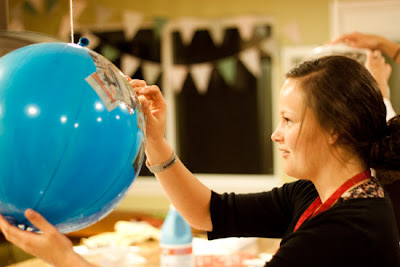 Find a place were you can hang the balloon while you work. 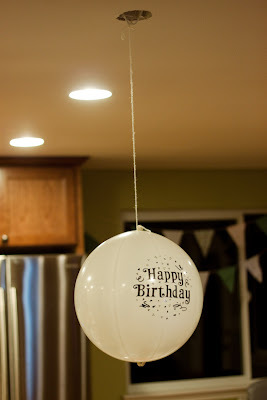 Hang the balloon up (to a comfortable working hight) using some string. Step 2. 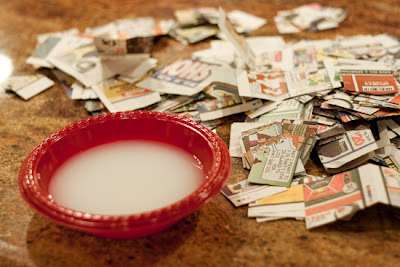 Cut or rip newspaper into pieces. Then pour the liquid starch into a small bowl. Step 3. Dip a newspaper piece into the liquid starch and pull off excess liquid with your finger. Then apply to balloon and smooth out creases as best as you can. Step 4. Apply as many layers as desired (I did 2). 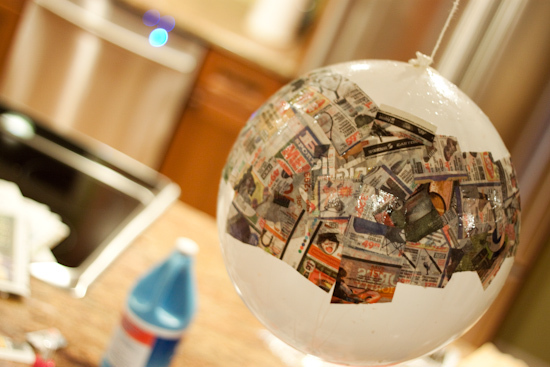 You will need to wait about 24 hrs for the newspaper to dry. Step 5. When everything is completely dry, pop the balloon and hang! That looks awesome! What a great idea. 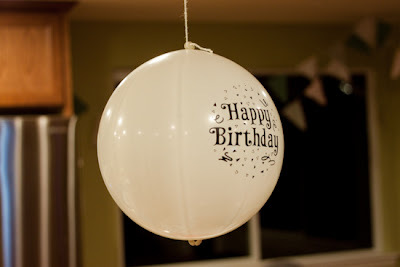 Love this idea with a giant sized balloon!! What a fantastic idea!! You are totally creative. I hadn't thought about using the liquid starch to do paper mache. 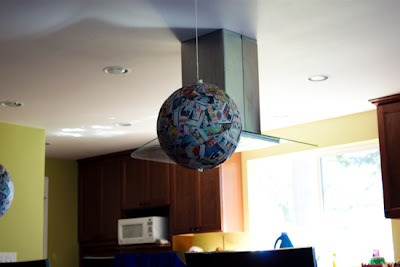 I've used it in the past to make my own fabric wall decals but I think I'll give it a try in an upcoming paper mache project with my son. Thanks for the idea!